Like our services for veterans, The Brego Foundation provides services at reduced rates or no charge for individuals in recovery from drug and alcohol addiction. We do this because we have walked this path ourselves. Our staff brings over 75 years of combined sobriety and direct experience working in Twelve Step Programs. For those in early sobriety, we offer programs that help develop emotional fitness, learning how to identify triggers in thought and behavior long before a relapse occurs. For those with long term sobriety, we offer a method for engaging all three intelligence centers in the body: the head, heart and gut to make more informed decisions, set and achieve goals, develop leadership skills and hone interpersonal communication. 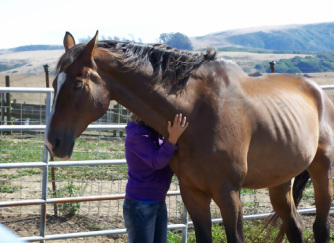 For Recovery Centers, we work with clients who are in their final weeks or days of treatment to strengthen their transition and aftercare plans, supported by experiential exercises with horses that develop the ability to set and maintain boundaries, emotional agility, and a greater access to critical sources of information. If you would like more information about these specific programs, please send us an email. Can Working with horses prevent relapse? Can the addition of Equine Facilitated Experiential Learning reduce the chances of relapse in early recovery? Studies have been evaluating the role of the hormone oxytocin and its impact on withdraw symptoms? Early evidence points to a dramatic impact on withdraw symptoms from alcohol with intra-nasal oxytocin. This treatment option is not available to all populations, however, and often limited to the more costly inpatient treatment centers. Is it possible to provide an alternative to those trying to get sober on their own, or treatment centers operating on a more limited budget? We believe that working with horses offers an extremely viable alternative. Interactions with horses triggers the oxytocin response in humans. More importantly, we believe repeated interactions with horses rebuilds potential atrophied pathways that have been reduced due to prolonged drug use.